What's the Book You Most Enjoyed in 2009? And you, dear readers, what was the book you most enjoyed in 2009? We'd love to hear about it. Still shopping? We're still here! With Parking! Just a reminder to all you Sam Wellers customers that we're still here at 254 S. Main Street. We're stocked from basement to mezzanine (and beyond!) with great books, and eager to sell them to you. This has been one of the strongest publishing seasons in memory. There's something here for you or the lucky recipients on your giving list whether you're looking for fiction that's literary or egdy, non-fiction that's serious or humorous, funky sidelines, or exquisite rare books. Oh there are so many wonderful books! We're also very happy to announce there is once again parking behind Sam Wellers Bookstore. The parking structure for the 222 S. Main building is now open for hourly parking. It can be accessed by via either 200 S. or 300 S., just west of Main Street. Simply enter the structure, choose a ticket for "Metered Parking" and then follow the signage to the "Metered Parking" areas. 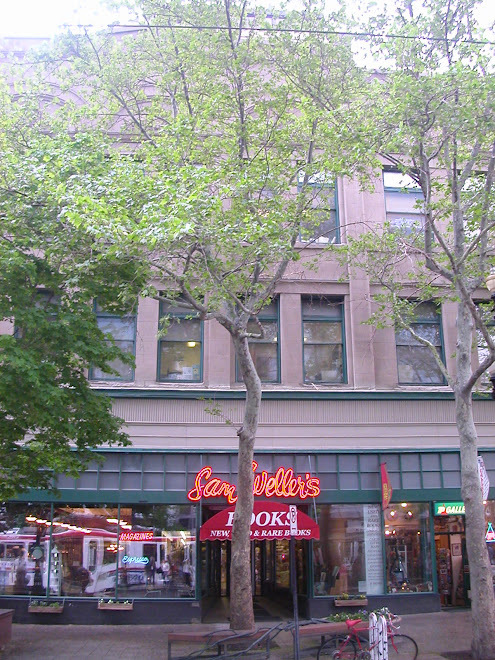 Then walk out the 300 S. entrance and into the back door of Sam Wellers. The 100 stalls in the "Metered Parking" part of the structure will charge Salt Lake City parking meter rates for the first hour. After that market rates apply. The system is entirely automated so there is no attendant on duty. Payment is made in at an exit kiosk. Be forewarned, they do not take cash: you must pay with a debit or credit card. Also, we do not have validations at this point. But we are delighted to see an additional parking option for our customers. While the City parking meters are free for the holiday season, that doesn't apply to the metered stalls inside the parking structure. Remember, books are some of the finest gifts you can give a person. Through them a reader can travel to other times and other worlds, learn from some of the greatest minds humanity has to offer, and dream of larger horizons and better times. 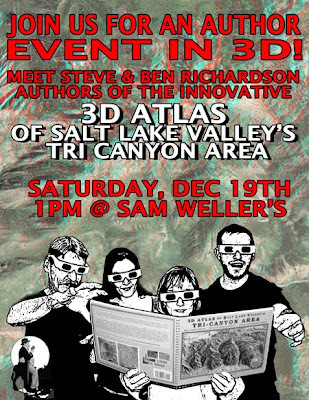 Steven L. Richardson and Benjamin M. Richardson will be at Sam Weller's Bookstore on Saturday, December 19th, at 1:00 PM to sign their amazing book, 3D Atlas of Salt Lake Valley's Tri-Canyon Area. This work on Salt Lake Valley canyons is a serious atlas, with accompanying scale, symbols and technical data. But, you may have so much fun with it you will forget that salient point. At first look the pages appear misprinted. But wait. Put on the accompanying pair of 3-D glasses and THEN look at the pages. Whoa! Big Cottonwood Canyon east of Salt Lake City suddenly appears in amazing 3-dimension. Each two-page spread has two views of the same area . . . one an aerial photo and the other a topographic map. Two pair of 3-D glasses accompany each book. Reasonably priced, and, a lot of fun. Sam Weller's Holiday Reading Window is a great time. Relax and read for a couple of hours in our front window; sip your hot cocoa, coffee or tea, and eat cookies. Send your friends in to shop while you're reading, and they'll get 10% off almost every item (excluding rare books, special orders and gift cards). 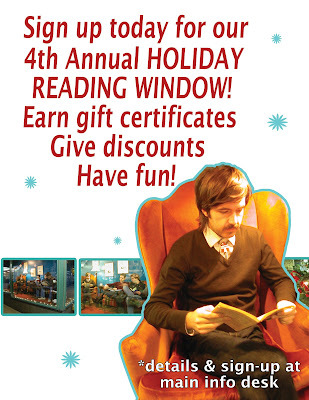 At the end of your two hour reading shift, you'll get a gift certificate for 10% of your friends' spending. Check out our guidelines for your time in the window. Call 801-328-2586 today to schedule your time. Authors tell why books make great gifts! 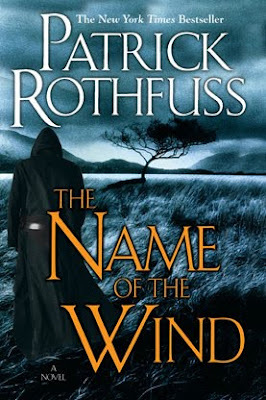 I started Patrick Rothfuss' The Name of the Wind on Monday during my flight home after Thanksgiving vacation. I couldn't set it down. Not while I waited for my luggage, not during the ride from the airport. Not until 3:30 AM on Tuesday morning, so close to the end, but I had to sleep so I could work on Tuesday. And as soon as I got home Tuesday night I picked it up again and read until it was finished. Come pick up a copy today. I know you'll find it just as entrancing.